For our Artist Spotlight this week, we're going to change things up a bit and look at an artist who works in decidedly non-traditional media. Working in digital media - it's probably not still fair to call it 'new media' any more, since it's been around for quite a while by now - is one of the most exciting areas of the art world. Much of the cutting edge of art is about pushing boundaries, and few things do that better than the work of Memo Akten. Akten was born in Istanbul, Turkey, but moved to London to attend the Goldsmith University where he is a practicing fine artist, and a PhD candidate - in artificial intelligence research. As such, much of his work is related to technology and interactive installations, and he's already amassed a long list of projects and press accolades. One of his latest pieces of work was actually discussed in our recent article about Google's Deep Dream neural network. As part of an exhibit dedicated to showcasing the possibilities of the artificial intelligence system, Akten was commissioned to create various works, one of which titled the post then and has been included again here, titled GCHQ after the secretive signals intelligence and national security office. 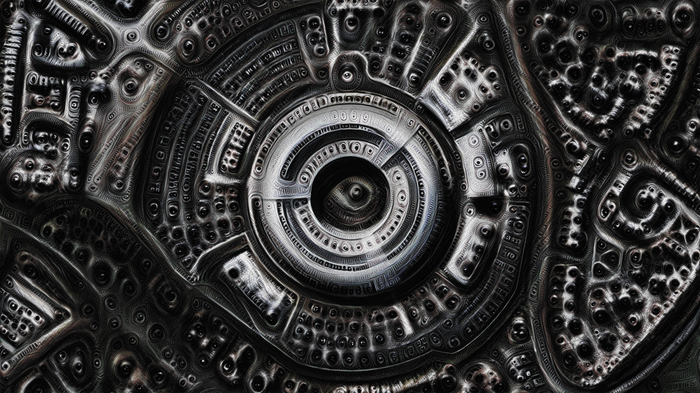 For those of you who missed the discussion on Deep Dream, Akten has a few brief words about how it works. Akten's work isn't just limited to artificial intelligence, and has begun to break through many of the traditional boundaries that have, until recently, delineated various forms of digital media and how they can be integrated and co-opted for use in artwork. Just recently he collaborated on a dance/tech hybrid performance/installation piece titled Pattern Recognition, which was on display at Central St Martins in King's Cross in April for a very limited engagement. “This is a new landscape. Working with these technologies is very much like cinema in the 20th century when people were just discovering the film camera, what worked and what didn’t,” he said in an interview with the Guardian. Here's hoping that he keeps pushing the boundaries and amazing us with his work!